Vada's Blog Stamp Inks and Paper : Artwork Brittle Batik from April 2006. 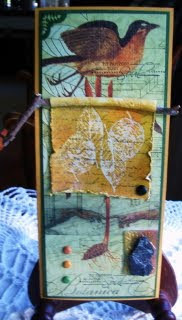 I did this card for the “Ancient Ages Challenge” over at Gingersnap. Would love to have you play along. 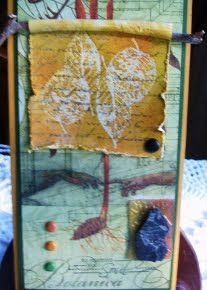 The center of the card is the Brittle Batik and I have added a “Fossil Stone” to the bottom of the card. My printed paper is from Graphic 45 the “ Botanicabella Collection”. The Hands stamp is from Art by Moonlight, Leaves are from Stampin’ Up, Writing from Hero Arts and To Nurture your Soul is from TAC. My Fossil stone is a piece of slate, which I stamped the leaf and embossed it. Labels: Gingersnap Creations Challenge, Hero Arts. Graphic 45. TAC. Stampin" Up. Art by Moonlight. This is amazing, Vada! There are so many unique elements to this piece, what a wonderful composition. Love it - cheers! Absolutely brilliant Vada! Love what you did with this challenge! Have a great weekend! Vada, your work is on TOP as usual. Love this piece. lovely Vada! this creation is very graceful.